Matthias Stom (or Matthias Stomer) (c1600-c1652) was a painter of the Dutch Golden Age. He was a master among the group of Dutch painters who were directly influenced by Caravaggio. The movement originated in Utrecht, where Stom was from. In that vein, Stom's work is characterized by extreme chiaroscuro and intense drama. He painted mostly religious scenes, with his portraits of saints, such as Ambrose and Jerome, particularly well regarded. Stom was committed to brining a certain realism to his biblical scenes, here the human and dismal aspects of the stories were foregrounded. 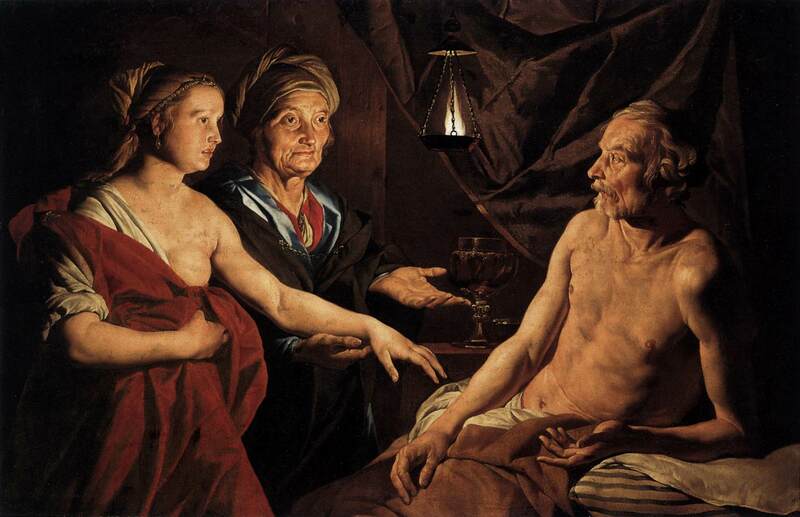 This is evident in paintings like Sarah Leading Hagar to Abraham (1637-39). 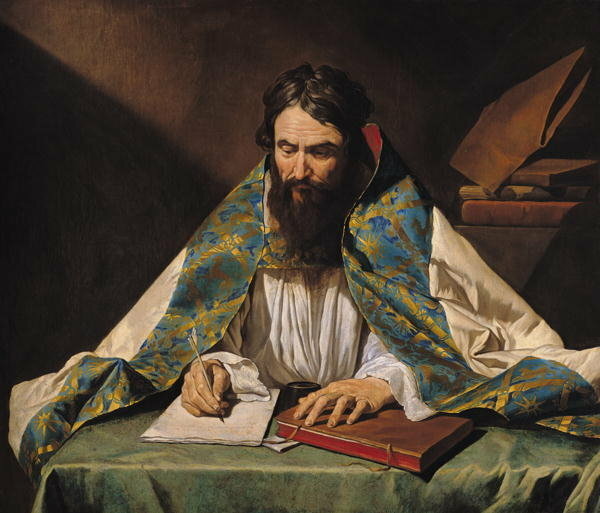 This is one of two portraits of St. Ambrose that Stom produced, and I find it quite beautiful. The painting is based on a description in Augustine's Confessions, wherein Augustine comes upon Ambrose reading silently to himself, which was less common although far from unheard of in antiquity. Augustine was struck by the idea silent reading to inform spiritual contemplation. Here we see Ambrose (perhaps following his reading with a stylus), deep in contemplation. His face is thoughtful and reserved, but with a quiet activity. Stom's skill is evident in the rendering of the light and shadows (not in full chiaroscuro) and elements like the leather of the book and the texture of the tablecloth. The most striking element, though, is of course Ambrose's cloak which drapes do beautifully over his shoulders. The white fabric is excellently portrayed, and the decorated edge is quite astounding. Stom conveys the shimmering and intricacy of the design, which acts almost like a medieval halo to illuminate the spiritual depth of the saint.